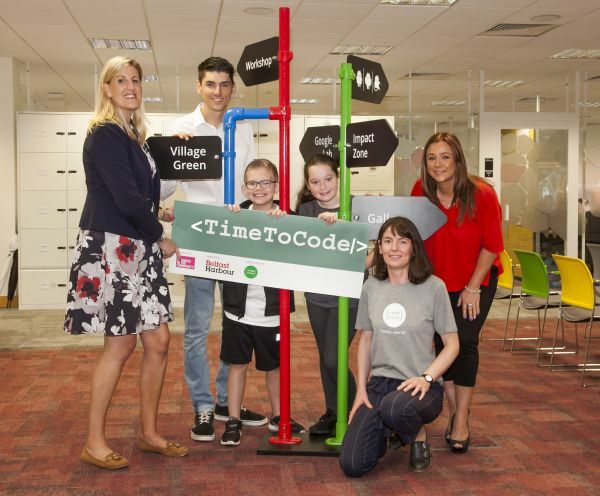 A group of business volunteers from leading Northern Ireland companies have joined forces to support pupils and teachers across the Greater Belfast area to explore the art of computer coding as part of a new education initiative called Time to Code. Time to Code, is a pilot volunteering programme run by Business in the Community in partnership with Code Club. It aims to help children at Key Stage 2 Level gain IT and coding skills, build their confidence, and develop their team working and problem solving abilities. The programme is supported by Belfast Harbour in the Greater Belfast Area, and BT in the North West. Ciara Mulgrew, Programme Executive, Business in the Community, explains: “In today’s digital age, IT literacy is so important. Young people are growing up surrounded by technology, but many still lack the basic IT skills that future jobs will demand. Volunteers come from a range of organisations including Allstate, Allen & Overy, ARRIS, Big Pixel Creative, Fujitsu, HM Revenue and Customs, Invest NI, Phoenix Natural Gas and St Mary’s University College. There are 14 local schools participating in the project which will start in September. Those in Greater Belfast include Elmgrove Primary School, Forge Integrated Primary School, Mercy Primary School, Our Lady Queen of Peace, Seaview Primary School, St Joseph’s Primary School, St Teresa’s Primary School and Taughmonagh Primary School. Code Club is a network of volunteers and educators working together to get the next generation excited about computing and digital making. It’s part of the Raspberry Pi Foundation, a charity that aims to help more people learn about computing. There are around 6,000 Code Clubs in the UK, and just over 250 in Northern Ireland. Young people attending Code Clubs learn to create their own games, websites and animations in a fun and stimulating environment. Would your business like to get more involved in education, or would you like to volunteer for Time to Code? If so, please e-mail ciara.mulgrew@bitcni.org.uk or call (028) 8046 0606.